FOR AN EXCITING EVENT !!!! Everyone is invited to participate in The November Festival to enhance awareness for the Glenn Highway Scenic Byway! Join us in the Fun, Song & Dance ! to view web sites of all of our sponsors!!! We have so much to offer and hope to bring as many people as we can from the surrounding areas to participate in this exciting event. Watch this site for more information and links to all of our supporters and contributors. On May 15th a Holland America Cruise Line representative will visit Palmer and The Glenn Highway Scenic Byway on a FAM trip provided by the Palmer Convention & Visitors Bureau. Hosted by Geri McCann, and her vision to see Palmer and the surrounding areas of The Glenn Highway Scenic Byway grow and prosper with economic development in Tourism. If we are selected as an area that the Holland America and Princess Cruise lines can market to their clients world wide, we are all in for a huge economic boost. Not only will we provide visitors from all over the world a chance to experience an Alaska that up to now has never been experienced by tourists, we will grow as an international destination bringing with it, jobs, employment and a stability to a failing economy that has plagued many who live in rural area such as ours. My hat is off to Geri McCann to her insight, vision, hard work against all odds to preserve and keep the light burning for all of us. Join us, in her vision……The Palmer Convention and Visitors Bureau. To become a part of this wonderful opportunity we need your support. Below is a letter of support you can sign and send to us, we welcome your ideas and look forward to a new beginning. We do not market ourselves self as a tourism destination as well as other communities do; as a result thousands of tourists come through our area in route to other destinations primarily for a nice rest stop instead of staying and spending. We support the Palmer Convention and Visitors Bureau’s (PCVB) mission to change that image, and re-introduce Palmer and Communities on The Glenn Highway Scenic Byway as an exciting and enriching cultural/adventure tourism destination. The PCVB is working hard to produce essential marketing tools such as; the Palmer Visitors Guide with regional attractions map, tourism website – (www.visitpalmer.org), and marketing the “Palmer Package” through FAMS, and booths at tourism related trade shows. We are partnering with these efforts by joining the PCVB and encourage the City to collaborate with the PCVB by joining, purchasing advertisements, and providing additional funds and resources to assist in the production and distribution of the Palmer Visitor Guide and essential marketing tools crucial to launching Palmer as a premier tourism destination. The greater Palmer region is coming together to market itself as one dynamic package and Alaska’s prime tourism destination. 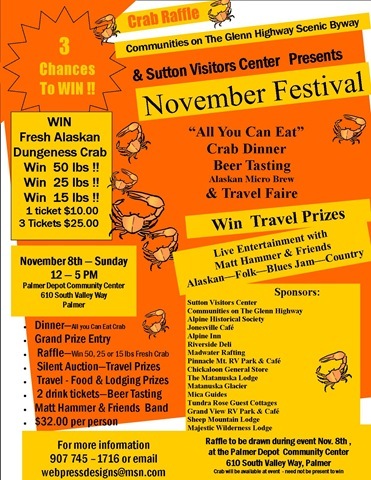 Please support the community and the PCVB efforts to promote tourism in Palmer and to communities along The Glenn Highway Scenic Byway. Help us get connected and intercept the tourism industry slipping through our fingers and town. ITS OUR TIME TO SHINE!! Show your support and sign below and email us! !